The growth of the global solid-state lighting market is gaining traction due to the increasing demand for energy efficient lighting technologies. The energy efficient lighting technologies conform to durability and improved productivity for reducing the level of greenhouse gases (GHG) is fuelling the growth of the global solid state lighting market. The rising awareness about the environment in developed and developing economies are witnessing higher demand for these energy-efficient technologies. Additionally, growing industrialization in the developing countries such as India and China are demanding energy efficient and cost-effective technologies is propelling the growth of the global solid state lighting market. The increasing adoption of LED lighting solutions mainly in the residential sector for energy efficiency and its cost-effectiveness is driving adoption of LED is bolstering the growth of the global solid state lighting market. The consumers in the developing countries of Asia Pacific due to rising technical expertise and favorable cost structure is bolstering the growth of the solid state lighting market. 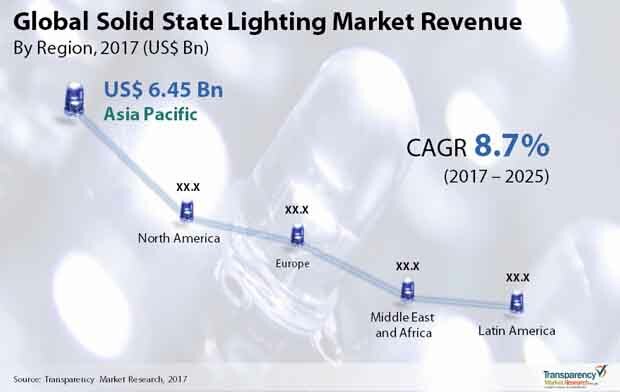 According to the report by TMR, the global market for solid-state lighting was valued at around US$14.48 bn in 2016 and is anticipated to expand at a CAGR of around 8.7% from 2017 to 2025 to attain a value of US$30.38 bn by the end of 2025. On the basis of the sector, the global solid-state lighting market is segmented into residential, commercial, industrial, and outdoor lighting. In 2016, the commercial sector is dominating the global market for state lighting. On the basis of technology, the global solid-state lighting market is segmented into LED, OLED, and others. Of these, the LED is accounting for a larger share in the global state lighting market. This growth is attributable to LED lighting solutions across all sectors globally. On the basis of end-user, the global solid-state lighting market is segmented into conventional lighting, consumer electronics, automotive and transport, healthcare, media, and entertainment. Of these, the automotive and transport is dominating the global market for state lighting and is expected to continue over the forecast period. This growth is attributable to the introduction of new and efficient forms of lighting technology. On the basis of region, the global solid-state lighting market is segmented into North America, Europe, Asia Pacific, Latin America, and Rest of the World. Of these, North America is dominating the global market for solid-state lighting owing to the presence of numerous key players in the region. However, the Asia Pacific region accounted for 40% shares of the overall market in 2016. This growth is attributable to growing government initiatives for the development of smart cities. Key players operating in the solid state lighting market include General Electric, Samsung Electronics Co. Ltd., Panasonic Corporation, OSRAM Licht Group, and Mitsubishi Electric Corporation. The state lighting market is witnessing growth with the moderate rate from the past few years. This is the emerging market in numerous regions; thus, the numerous new players are trying to enter into the market. These new entrants are expected to intensify the competition in the coming years. The report covers the analysis and forecast of the solid state lighting market on a global and regional level. The study offers historic data of 2016 along with the prediction for the period between 2017 and 2025 based on revenue (US$ Bn). The study provides a complete view of the solid state lighting market by segmenting it based on sector, technology and end-user. By sector, the solid state lighting market is segmented into residential, commercial, industrial and outdoor lighting. On the basis of technology, the solid state lighting market is segmented into LED, OLED and others. By end-user, the solid state lighting market is segregated into conventional lighting, consumer electronics, automotive & transport, healthcare, media & entertainment and other type of end-user such as logistics & warehouses, defense, e-commerce, and other related industries. The competitive reporting of the important players in the global solid state lighting market across five broad geographic regions is included in the study. These include diverse business strategies adopted by the principal players and their recent developments as in the field of solid state lighting. A complete analysis of the market dynamics that is inclusive of market drivers, restraints and opportunities is included in the purview of the report. Additionally, the report includes potential opportunities in the solid state lighting market on the global and regional level. Market dynamics are the factors which impact the market growth, thereby helping to understand the ongoing trends of the global market. Therefore, the report provides the forecast of the global market for the period from 2017 to 2025, along with offering an inclusive study of the solid state lighting market. The report provides the size of the solid state lighting market in 2016 and the forecast for the next nine years up to 2025. The size of the global solid state lighting market is provided in terms of revenue. Market revenue is defined in US$ Bn. The market size and forecast for each sector, technology and end-user segment are provided in the context of global and regional markets. Numbers provided in this report are derived based on demand generated from different applications. Market dynamics prevalent in North America, Europe and Asia-Pacific have been taken into account for estimating the growth of the global market. Demand for solid state lighting has been derived by analyzing the global and regional demand for solid state lighting in each end-user industries for its respective functions. The global solid state lighting market has been analyzed based on expected demand. Forecasts have been based on the expected demand from solid state lighting end-user industries. We have used the bottom-up approach to estimate the global revenue of solid state lighting market, split into regions. Based on end-user industries, we have summed up the individual revenues from all the regions to achieve the global revenue for solid state lighting. The end-user industries split of the market has been derived using a bottom-up approach for each regional market separately, with the global application segment split being an integration of regional estimates. In the absence of specific data related to the sales of solid state lighting of several privately held companies, calculated assumptions have been made in view of the company’s product portfolio and regional presence along with the demand for products in its portfolio. Regional breakdown comprises the present and forecast demand for North America, Europe, Asia-Pacific, Middle East & Africa and Latin America. These have been further sub-segmented into countries and regions with relevance to the market. The segmentation also includes demand for solid state lighting across sectors and end-user industries. Key players in the solid state lighting market are General Electric, Samsung Electronics Co. Ltd., Panasonic Corporation, OSRAM Licht Group, Mitsubishi Electric Corporation, Eaton Corporation, NICHIA Corporation, Koninklijke Philips N.V., Seoul Semiconductor Co. Ltd. and Applied Materials, Inc.